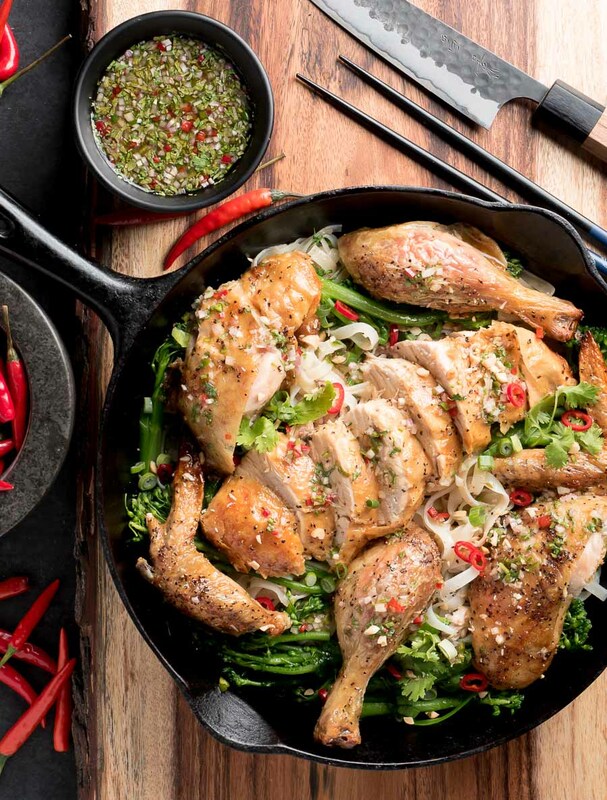 Thai roast chicken is a great way to break out of your roast chicken funk. Roast chicken is great. But roast chicken with big Thai flavours is even better. I don’t know that this is actually a Thai dish. The flavours are mostly Thai. The roast chicken technique is actually French. The dipping sauce is all Thai. The greens could be from anywhere in Asia. I’m calling it Thai roast chicken though. But it doesn’t matter what you call it really. It’s just a delicious jumble of Asian flavours bolstered by a little French technique. Roast a chicken. Make a bit of pan sauce. Cook some asian greens and rice noodles. Plate the noodles, then the greens and then the carved chicken. Drizzle the pan sauce and the Thai dipping sauce overtop. Garnish. Eat. If that seems like too much, just make the chicken. Serve it over some rice noodles. Not as flashy. But still delicious. The mixture of the pan sauces and the Thai dipping sauce is what really makes this work. You get the earthy richness from the pan drippings, a bit of fat for mouthfeel and the bright herbal chili flavours from the dipping sauce. It all comes together beautifully. A marriage of French and Thai tastes and techniques. The star of this dish is really the nam jim. Thai dipping sauce. That’s what makes this Thai roast chicken. It’s a crazy delicious mixture of sweet, salty, sour and spicy. It’s great in this dish. But it’s great on pretty much everything so that’s not a big surprise. I first made it as a sauce for chicken wings but since then I’ve found all sorts of ways to use it. Grilled chicken, eggs, beef. Or as a salad dressing. A really good salad dressing. I got the idea to carve up the chicken from a brilliant local restaurant. I can take zero credit for the idea but I’m going to use it all over the place. 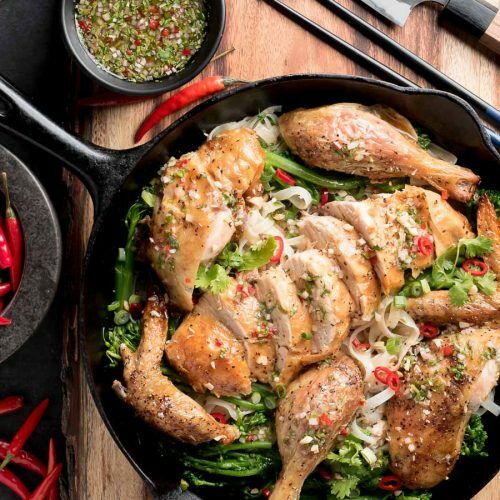 Serve Thai roast chicken in bite size pieces. Makes a great dish to eat family style with chopsticks. It’s just fun this way but you could also serve it on individual plates. Any way you look at it though, this is good eating. 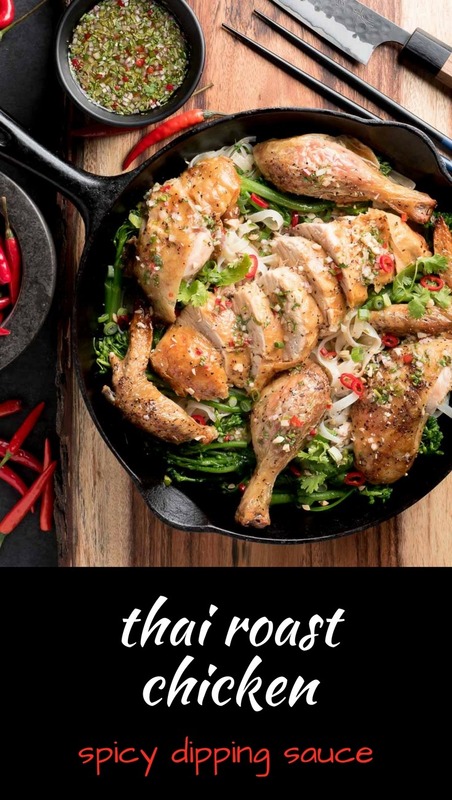 This Thai roast chicken is flavoured with a Thai dipping sauce and pan drippings for really, really big flavours. Serve family style on rice noodles with an asian green of your choice. Start soaking your rice noodles before you roast the chicken. They will take an hour. Pre-heat your oven to 400F. Pre-heat your roasting pan (a skillet works well) in the oven. Rub the chicken with the oil. Roast the chicken, legs facing the rear of the oven for 15-20 minutes. Baste with pan drippings. Continue roasting the chicken, turning occasionally to ensure the chicken roasts evenly, until the breast reaches an internal temperature of 165F and the legs reach 175F, about 25-30 minutes more. Remove from oven, place chicken on a cutting board with a groove to catch the juices and let rest while you cook the noodles. Spoon off 4 Tbsp chicken fat and reserve to cook the noodles. Spoon off the rest of the fat (discard), place the pan over medium heat and add the chicken stock. Scrape up the little bits in the bottom of the pan and stir to get them to dissolve. Lower heat to as low as your stove will go. Soak the rice noodles in hot tap water. They will need to soak for about an hour to soften properly. Heat a frying pan or wok over medium heat. Add the chicken fat or vegetable oil to the pan. Drain the noodles well and stir them into the hot oil. You are finishing cooking the noodles. This takes about 2 minutes. Stir in the green onions and nam jim. Add the oil and heat until shimmering. Add the garlic and ginger and cook briefly, about 1 minute. Add the asian greens and stir fry for 2-3 minutes. Add a splash of stock, cover, and cook until just barely done. Add a splash of soy and stir. Carve the chicken breast from the bone. Remove the wings. Slice the breasts into bite size pieces. Remove the legs. Cut the drumsticks from the thighs. Cut the bone from the thighs and slice into bite size pieces. Pour any accumulated juices into the roasted pan with the rest of the chicken juices. The juices that come out of the chicken when you carve it are pure flavour. Never let them go to waste! Place the noodles on a large plate. Place the greens on the noodles, then arrange the chicken overtop. 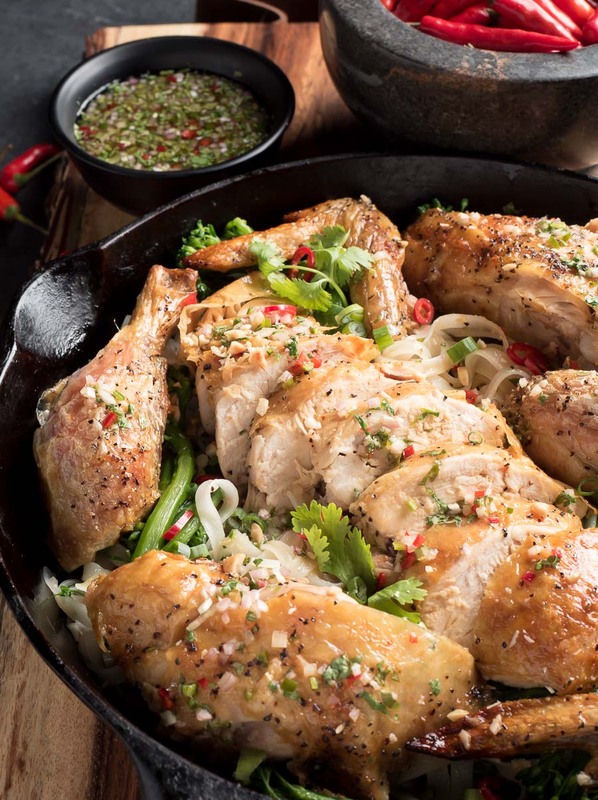 Spoon the roasting pan juices over the chicken and then drizzle with nam jim to taste. I like about 4-5 Tbsp of the nam jim here. Garnish with cilantro, red chili and chopped peanuts. Start soaking the rice noodles one hour before cooking. Start soaking them in lots of hot tap water before you put the chicken in the oven. 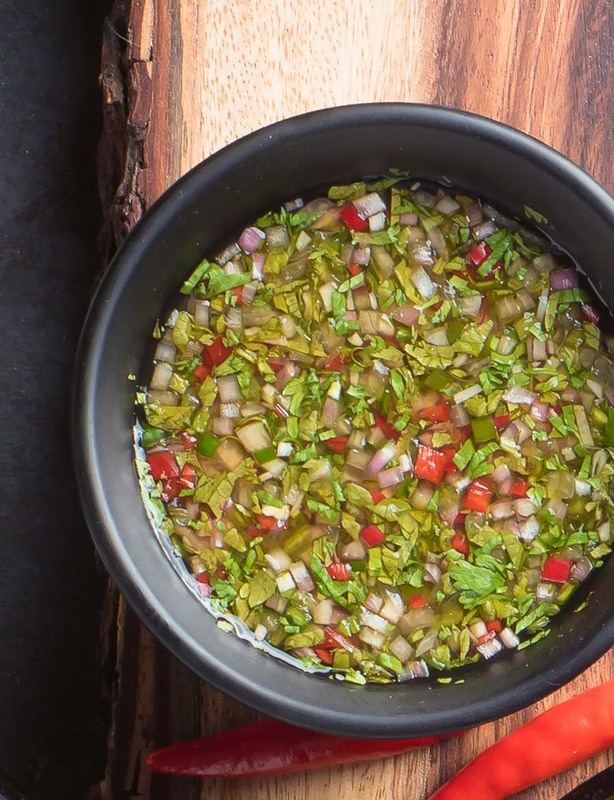 Nam jim is a wonderfully complex Thai dipping sauce that's fantastic on almost anything. The recipe can be found here.